CAF was contracted to construct ten new high-speed trains for the Ankara-Istanbul project with a maximum speed of 250km/h. The new trains feature air-conditioning, like all other modern high-speed sets. While other high-speed railways operate at 300km/h, including in Germany, the trains can also run on conventional lines. The Turkish high-speed line will have a maximum operational speed of 250km/h. Overhead electric wires supply 25kV AC power to the new trains between Istanbul and Ankara. Turkish Railways (TCDD) has constructed the country’s first high-speed railway line, which connects the capital city of Ankara with largest population centre of Istanbul, and serves more than 17 million people. 12 million journeys per year are made between the two cities, stretching the mix of road and conventional rail lines to their limits. Many towns along the corridor suffer from acute congestion and pollution. TCDD embarked on the high-speed project to ease this problem, and journey times will be greatly shortened as a result. It is also hoped that more of the 48 million tonnes of freight carried by road each year can be transferred to rail, way beyond the present disappointing 3% modal share. TCDD divided the Ankara-Istanbul high-speed train project into two phases. The first involved the construction of a 251km (157 mile) section of fast line between Sincan and Inonu at a cost of $747m. The project’s first phase was developed sectionally. Construction of a 206km section connecting Esenkent and Eskisehir was initiated in September 1999. Construction of the section began in December 2003 following foundations made in June 2003. Construction of the line was completed and first test run took place in April 2007. Construction of the 30km-long section connecting Eskisehir and Inonu was initiated in April 2008 and was completed by January 2014. Construction of the section of line connecting Sincan to Esenkent began in April 2008. The infrastructure works on this 15km section were completed and provisional acceptance of work was accomplished in October 2008. "TCDD divided the Ankara-Istanbul high speed train project into two phases." As of 2009, construction of the section connecting Ankara to Sincan was underway. However, the Ankara-Eskisehir section, opened in March 2009, uses the existing track between Ankara and Sincan. The second phase covered much more complex terrain, and was undertaken in two sections. The first is 158km (98.75 miles) long between Inonu and Kosekoy including more than 60 bridges and viaducts. This section is expected to be completed in 2010. Completing the second phase is a 56km (35 mile) section between Kosekoy and Gebze. In total, the second phase cost $2.27bn. The entire route is 533km (333 miles) long, 44km shorter than the existing alignment. The Ankara-Istanbul project was one of the biggest to be implemented by Turkey’s Ministry of Transportation. The main aim was for shorter journey times along with a fast, secure and safe way to travel away from roads. Major improvements were needed from the previous route to allow trains to operate at speeds of up to 250km/h (156mph). These improvements could only be brought about by a completely new high speed line. The original 576km alignment between Ankara and Istanbul was single track apart from a 198km double section. This had been a major drawback to the improvement of services, and the new line was built with double track throughout its length. Another drawback of the existing rail route was its many tight curves, which had slowed train times. These do not feature on the new electrified line. Construction on the first phase of the route began in 2004 and was completed in October 2008. A consortium led by Spanish company Obrascon-Huarte-Lain and Alsim-Alarako carried out the construction work involved in the first phase. The second phase was a greater engineering challenge, primarily because it involved building 33 bridges and viaducts and boring 39 tunnels. The contract for the Inonu-Kozekoy section was let to the CRCC-CMC-CENGIZ INS.-IC ICTAS INS consortium in 2005. The entire line brings a massive reduction in end-to-end journey times, down from 6hr 30min. HT65000 six-car trains manufactured by CAF, Spain are used on the first high-speed rail line operated by TCDD. In comparison to other national orders, TCDD’s order of just ten is small. They have a maximum speed of 250km/h (156mph), and each six-car train has space for 419 passengers. It features air-conditioning, video surveillance, television and music broadcasting equipment, disabled access and vacuum toilets. A computer-controlled diagnostic train control and monitoring system is installed. The new trains were bought with a foreign loan to be repaid over 22 years. They operate on the first phase of the route between Ankara and Eskisehir, with a journey time of 60min. 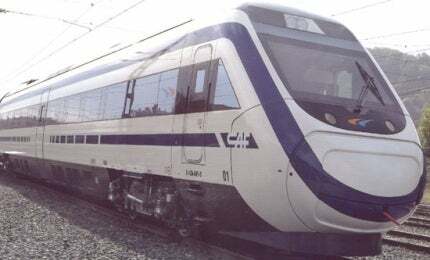 In the future, they will be used on the full length of the high-speed line as well as on the Ankara-Konya high-speed line, which is also under construction. French company Alcatel won the contract to equip the new route with signalling and communications equipment to the value of $80m. It is being fitted with ETCS Level 1 automatic train control to ensure total safety, including bi-directional running on selected double-track sections. "The Ankara-Istanbul journey time has been reduced from 6hr 30min to just 3hr." Alcatel is also designing, installing and integrating 24 LookTrac electronic interlocking systems for safe train routing together with two NetTrac central traffic control systems, signals, track circuits, and electro-hydraulic point machines. Communications systems include fibre-optic and copper cable networks plus a digital transmission and telephone system. The Ankara-Istanbul fast line is just the first of a series of such high-speed projects in Turkey, and contracts have already been awarded for the Ankara-Konya high-speed train project. The Ankara-Istanbul journey time has been reduced from 6hr 30min to just 3hr. TCDD also expects that the share of rail transport in the passenger segment along the corridor will increase from 10% to 78%. CM4 has proven experience with over 30 years in the design and turnkey construction of railway equipment, test benches, quality control equipment and special tools.